Magnificent Aquariums is renowned for their Custom Aquariums and Luxury Fish Tanks. Serving all of South Florida and beyond for over 25 years with the premiere luxury aquarium service and fish tank maintenance service. Our custom aquariums are the perfect centerpieces from zoos and larger style exhibition arenas. Our saltwater tanks are featured in many learning centers with touch style tanks, shark lagoons, reef tanks, and delicate tropical fish mediums. No matter what style custom aquariums your business or upscale residence requires, we can do it in a timely manner and exactly how you envision. 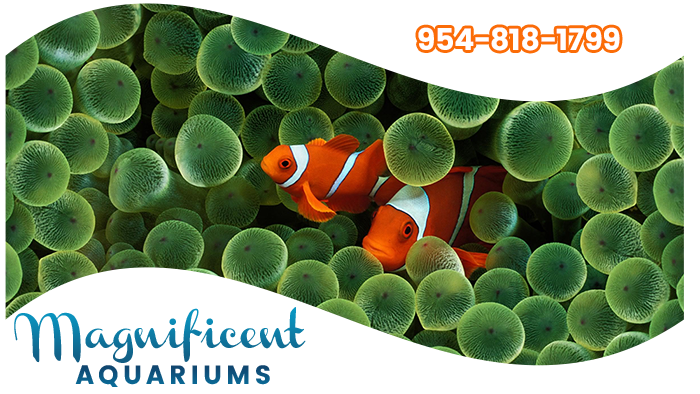 Magnificent Aquariums is known for designing and engineering the ideal marine environment per your most exotic request. We will work in tandem with you or a design team to make the perfect fit for your architecture and blend it perfectly. Our saltwater tank engineers will work with your contractor, interior designer or architect to seamlessly mold any type of custom aquariums into an existing or new area. Magnificent Aquariums is led by Bryan Ehlers, who studied Marine Biology at FAU. He has traveled across the globe immersing himself into the field and is deeply passionate about caring for marine life. Caring for and keeping a healthy custom aquarium requires a regular fish tank maintenance service plan that is proactive with knowledgeable techs versed in many different types of marine environments and custom tank styles. Magnificent Aquariums has worked with many different higher learning institutions and is often requested for difficult assignments. Our upscale luxury fish tanks are found in many fining dining establishments around the United States. Restaurants are great places to display custom aquariums as they can be easily enjoyed by the masses. Doctors offices and dentist are another group that incorporates luxury fish tanks and custom aquariums into their offices. Fish tanks are a great escape that allows patients to easily be taken to another place mentally. Magnificent Aquariums has extensive experience in the engineering of custom aquariums as well as professional fish tank maintenance. From small private homes to world class zoo exhibits, we have done it all.